...and your life will be sublime! In the "Hare krishna Explosion" Of Hayagriva dasa, Srila Prabhupada tells Kirtananda: "Perform deity worship, it will purify you". I took this instruction to my heart, and I'm so blessed to have Sri Sri Gaura Nitay at home. They are so merciful who let me take shelter at their lotus feet. I beg for forgiveness for all the offenses I make daily in their presence. I love bathing them, dressing them and offering them flowers and insence. Maybe it purifies me, I hope so. At least I get more attached to them, and that is an instruction from my Guru Maharaja. I heard in a lecture of Bhakti Vidya Purna Swami (BVPS) that a man can only go home to Krishna by being attached to Krishna. A woman can go back in three ways. So if we daily worship Krishna by chanting his names, reading his pastimes and hearing about his glories, we will somehow be attached to Him. I pray to Krishna that I may fulfill this wonderful instruction from my Guru Maharaja. Today I dressed Sri Sri Gaura Nitay in pink dresses. Choosing the color of their dresses if hard...and not to talk about their jewelry... 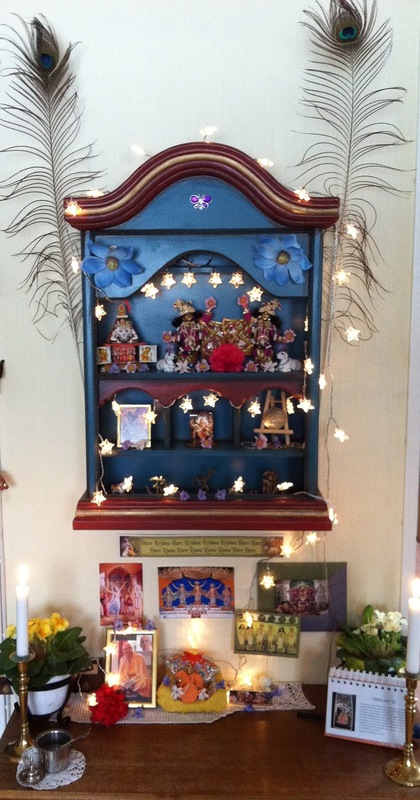 I have this dream that one day Krishna will let me dress Him on a big altar. A dream of being a pojari...well, if Krishna wants me to be one, He will arrange. Ultimately it's all up to Him. We should be eager for His mercy. Wherever we might get some mercy, we should jump to take it. One day it's to late... Prabhupada said it takes one minute to be Krishna conscious. One minute. So if we really want it, it's there...Haribol! Yudhi is a wonderful chef! My husband also writes a blog. 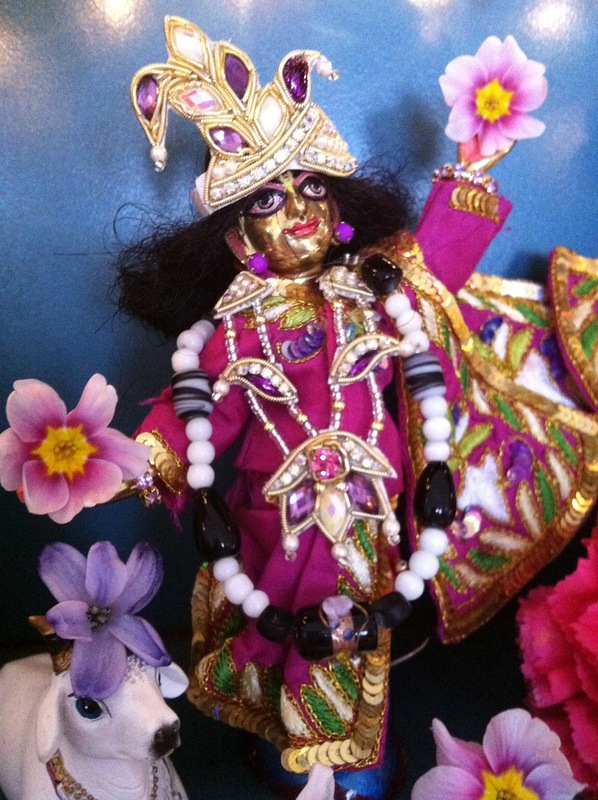 He writes poems about Krishna... check out my links, there you will find his page. "Sometimes when Radharani would get out, Krishna would attack Her, and when She would fall down - "Krishna, don't torture me in that way" - They would fall down, and Krishna would take the opportunity to kiss Her. 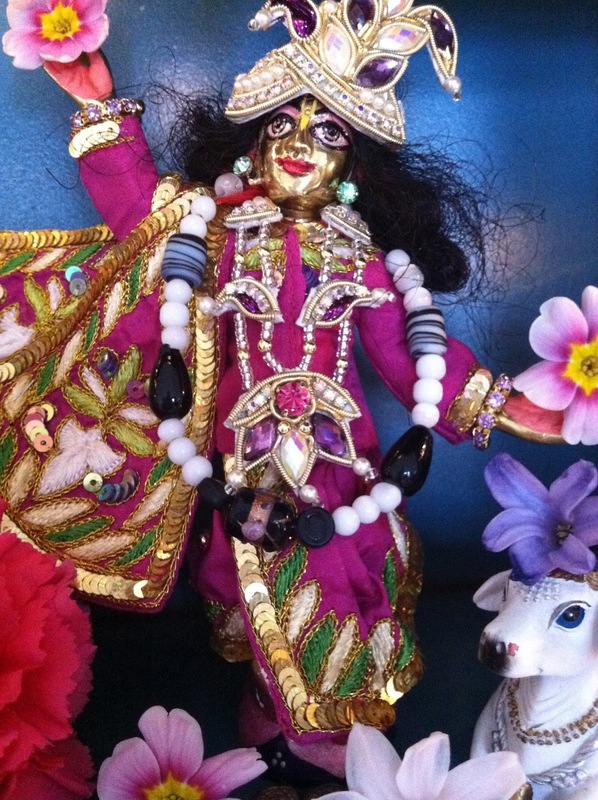 Radharani was very pleased, but superficially Krishna was the creates rascal. Unless rascaldom is in Krishna, how would rascaldom be existent in the world? Our formula of God is that He is the source of everything. but His rascaldom is so nice that everyone worships His rascaldom." Hare Krishna devotee and disciple of His Holiness Kadamba Kanana Swami, mother of a Gopi and living just outside of Oslo. Chant and be happy. Watermark theme. Powered by Blogger.